She talks about the Mr Rogers sweater. Jasmin has been working on the #ChooseYourOwnAdventureKAL flowchart. Gigi has chosen the Vitamin D cardigan by Heidi Kirrmaier for the #ChooseYourOwnAdventureKAL. 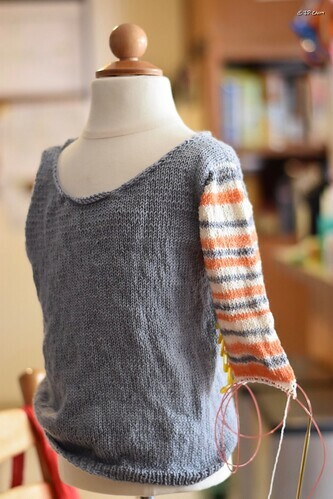 Jasmin is almost done with the first top down, set-in sleeve of the BB8 little sock arms sweater. Gigi swatched for the next cowl out of Black Trillium Pebble Sock in the "My Little Rainbows" colorway. And she finished another preemie hat out of Malabrigo Ceresa. from The Fiberseed Yarn Company for The Great Knit-off!. Open for orders now, KAL starts June 1. Gigi finished the knitting of the cowl in the Knitmore colorway. Gigi finished a preemie hat in the Malabrigo Ceresa. Cast on the next one. She talks about Hyperbolic crochet and the coral reef project. June 1st: Great Knit Off! The Knitmore Girls colorway benefits the International Rescue Committee! Split Yarn zipper tutorial, and black light reactive markers and black light. Knitting at the winery: Gigi was attacked by a glass of Merlot that tipped over into her tote bag. The Erin Lane bag was water repellent enough to protect the project, nothing got onto the yarn. The book they are using is Patternmaking for Fashion Design. Gigi worked on a UFO: the Knitmoregirls dress. She re-did the back seam. understitched it, armhole openings, side seam. Working on midriff.